I just finished the first book in this series, The Dragon Engine, and I jumped right in to this next book because I was on such an octane high from the story. Author Andy Remic picks up right where the previous book left off and adds some complications (as if Beetrax, Lillith, Dake, and Talon needed more complications). In addition to the story following our band of intrepid heroes we have the story of the dragons who’d just been released back into the world at the end of the previous book, as well as the (re)introduction of a different band of heroes – those from Remic’s Rage of Kings series. And we also have a slightly surprising side story of one of the villains from the previous book. It is non-stop action upon action, bouncing between all the different aspects of the story. And that’s a little bit of a problem. In the previous book we had a relatively clear story path. We followed Beetrax and his associates through battles and highs and lows (fearsome lows!) and we had faith that following the characters would tell a story. Which it did. But now instead of a character-driven story, we’re suddenly tossed an adventure with multiple characters and multiple stories and it’s just a little bit challenging to keep it all straight and to really enjoy what Remic has put together. Instead of the pinnacle that Remic was preparing for through the various books and series’ we get a conglomerate mess and an unfocused story. Still…it’s Andy Remic, and if you like his work, there is still much to enjoy. There are still the colorful characters and brutal battle sequences that practically define a Remic story. The problem is that there is so much of it that you can’t really savor what’s there. I’ll keep reading Remic, and I’d like to stay within this world, but I’d rather a slower series of events that tells a story than this rapid fire adventure. Looking for a good book? 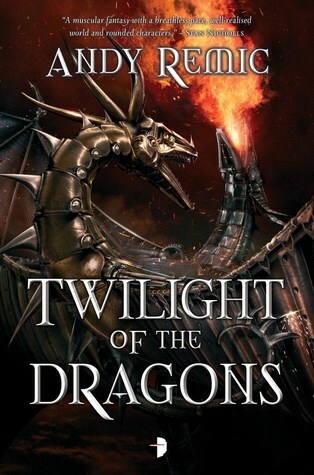 Twilight of the Dragons by Andy Remic follows up on the adventures begun in The Dragon Engine as well as the Rage of Kings series but loses some focus by trying to do too much.